When the Daniells arrived in Calcutta in 1786, the town was known as the 'City of Palaces'. 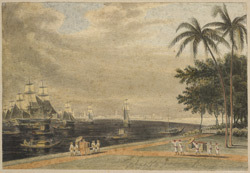 Garden Reach, a suburb of Calcutta, was one of the most fashionable areas of the city where many Europeans built Palladian mansions with grounds sweeping down to the river's edge. Calcutta lies on the banks of the River Hooghly, a tributary of the Ganges.